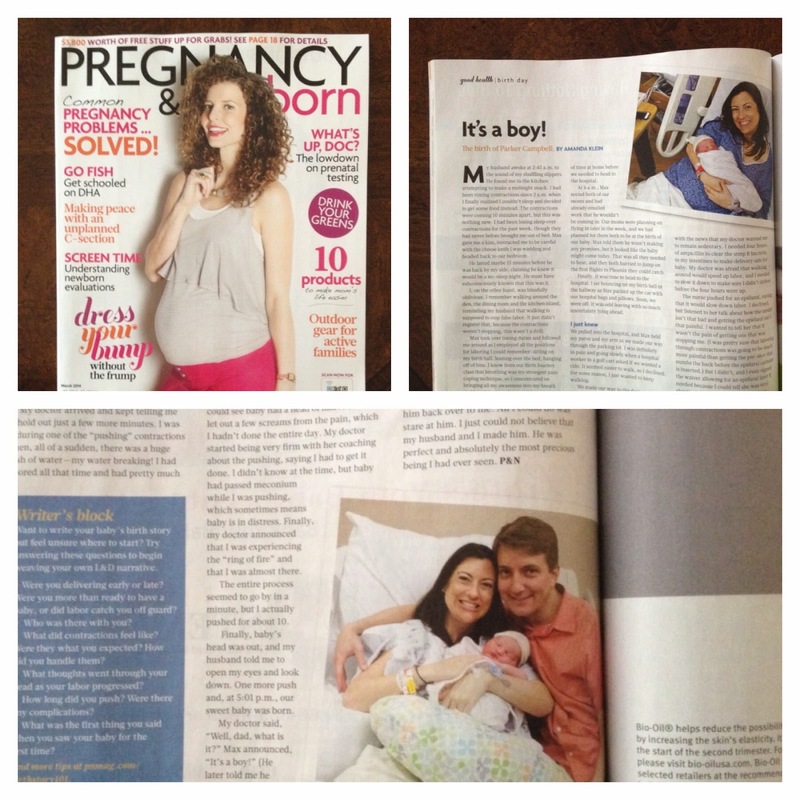 Pregnancy & Newborn Magazine has published Parker's birth story in their March issue! 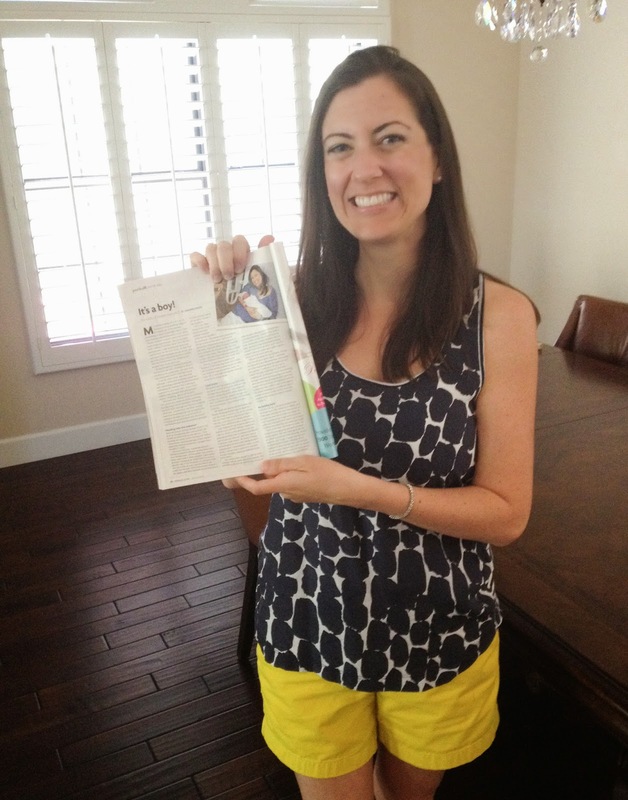 They feature one birth story a month, and I am so excited that they chose my story to share with their readers. It's extra special that they chose the March issue as March also happens to be Parker's birth month! It's hard to believe that it's been a whole year since our sweet son was born, a whole year since he made me a mamma! 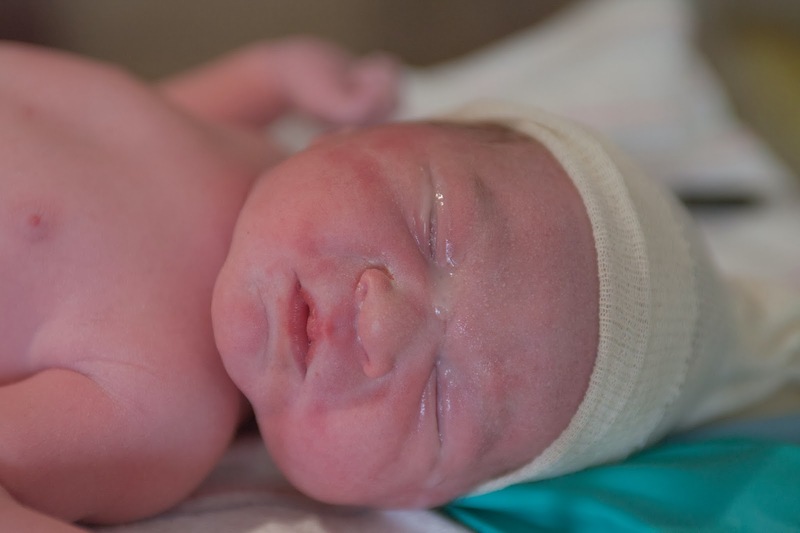 If you've read the story, you know that I labored and delivered epidural-free. I remember that soon after delivering Parker, I commented that my husband should get an award or teach a class on how to be a labor coach (y'all, he was awesome!). However, right after I made that comment, my L&D nurse suggested that I should teach a class on how to deliver naturally. I remember thinking her suggestion was kind of silly. Then I thought back to my days and months preparing for the big day, and my difficulty finding a single "program" that I thought would work for me. I realized I did have advice for mammas who want to deliver naturally. You see, after we made the decision to have a natural childbirth, I attempted to seek out programs to help me prepare for labor and delivery, but nothing seemed like the right fit. There was The Bradley Method, Lamaze, Hypnotherapy... I didn't see any of them working for me. One day, I came across a Birth Plan template that was handed out in my prenatal yoga class. Under the "Pain Management" section, it asked which strategies would be employed if no drugs were to be used. It was then that a lightbulb went off in my head - I would simply compile tons of pain-coping strategies. I would stockpile them and draw on them as necessary to get through the pain of labor and delivery! I didn't need a program, I would pick and choose things that would work for me! I have had a handful of soon-to-be mammas reach out to me in the past year for advice on birthing naturally. I love sharing my experience and what worked for me, so I thought I would finally put it into writing. In my opinion, there are two prerequisites to a natural childbirth. The first is the actual desire to do so. It's not something that you can go into half hearted. Max and I had a number reasons for making our decision. First, we wanted to intervene as little as possible. Our thinking was that womens' bodies were created to give birth, and we simply wanted to let it happen naturally. 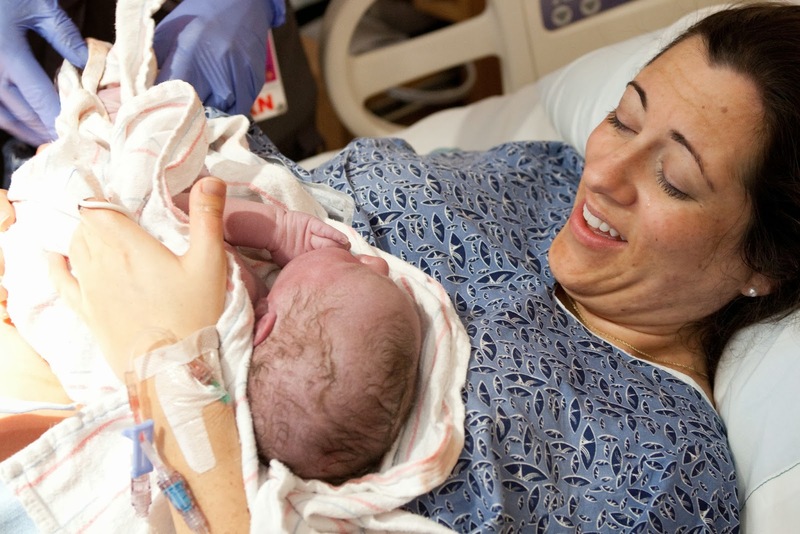 Epidurals often slow labor, which in turn leads to hospitals administering Pitocin to speed things up, which sometimes puts baby in distress (and can lead to the need for a Cesarean Section). To us, the decision to eliminate even this remote chance was a simple one. Next, I personally did not want the effects and possible complications of an epidural. 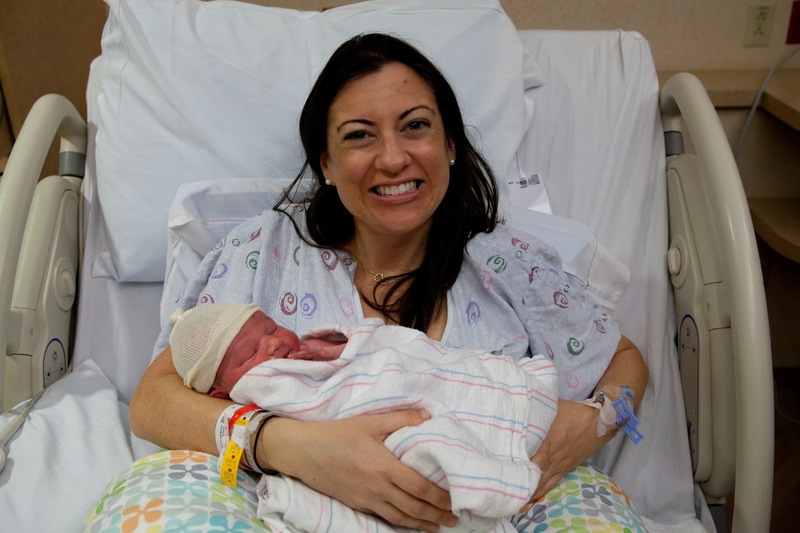 I wanted to be able to walk around; I did not want a catheter, and the thought of my legs possibly being numb even hours after giving birth sounded frightening. Last, I didn't so much as take a Tylenol my entire pregnancy, so continuing to be drug-free all the way up to delivery seemed fitting. I know that the majority of women do labor with epidurals, and have successful deliveries and healthy babies. I've read happy birth stories about soon-to-be moms eating popsicles and laughing and playing games with visitors, all while laboring with an epidural. I just knew that my story was going to be different. I wanted to be in it, fully experiencing everything. I had internalized all of my reasons for wanting a natural childbirth, so when the big day did arrive, there was no waivering. No going back-and-forth about wanting drugs, no fence to be perched upon. My mind was set, and that was a necessity. The second prerequisite is a body that cooperates. In the months leading up to Parker's birth, I devoured every birth story I could get my hands on. 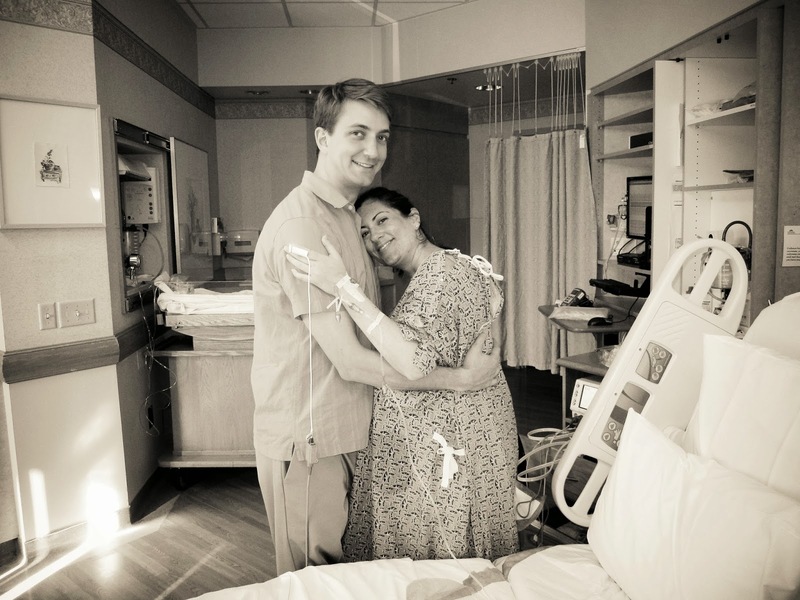 I read about moms who desperately wanted to deliver naturally, but had complications. Women who needed to be induced with Pitocin, whose babies were breech, or transverse, or had become stuck, women who were labeled with "failure to progress"... obviously, a natural childbirth is not possible if your body is not cooperating (I was walking around at 2 centimeters dilated and 75% effaced at 38 weeks pregnant, so I was blessed with a body that was ready for labor and delivery!). I took prenatal yoga once a week for my entire pregnancy (and twice a week the last month and a half). It was the single best thing I did to prepare for L&D. In addition to moving and stretching every week, we practiced breathing. It might sound silly, but this was hands-down the most effective way (for me) to deal with pain. We would practice "bringing all of our awareness into our breath" and would even breath through pain right in class. Our instructor would have us hold a squat and breathe through it. I remember the exact class where the technique started working for me. The pain was lessened, I was focused on my breath, and it was so empowering! Of course I internally groaned each time my teacher announced we would be doing the exercise, but I was secretly happy, too because I knew it would be helping me for the big day. And help it did. During each contraction, I was able to shut everything out and concentrate solely on my breath (all that breathing was delivering yummy oxygen to my body for added benefit!). I also adopted a chant to mentally repeat while I was in labor. We sometimes were given affirmations in class to repeat while breathing (positive ones about having a strong body and happy baby) and it made sense to me to do this while laboring. Max and I attended two different birthing classes in preparation for the big day, and though the classes couldn't have been more different (one was a natural childbirth class given at a birth center, the other our hospital's pro-epidural birth class) both of them touched upon the power of movement for coping with pain. While we practiced many different positions, I can say that while in labor, I just tried to do whatever felt good. I knelt on our carpet, sat on my birth ball, hunched over the dining room table, and stood hanging my arms around Max. At the very, very end I just wanted to lay down (and literally minutes later, my sweet son was born). File this under "Nice, But Not Necessary" :) Essential oils were introduced to me in my Labor Journey class at the Babymoon Inn. Our instructor had us sniff Peppermint and Lavender oils. Peppermint was supposed to be energizing, and Lavender calming. Peppermint also apparently helped with nausea. I thought at the very least, I could enjoy a nice scent and perhaps it would be a distraction while in labor, so I made aromatherapy washcloths during my last few weeks preggers. I modeled them after the fabulous ones at Burke Williams Spa in San Jose: they have a little refrigerator in the women's spa area that has cold, damp washcloths with yummy essential oils. The cloths are wrapped in saran wrap and closed with a sticker (and are lovely to put on your forehead while relaxing in the Burke Williams hot tub). I made mine by dunking plain white washcloths in water and adding some Lavender or Peppermint drops (or both on some). I kept them in the refrigerator up until we left for the hospital (and we transferred them to my room's mini fridge once at the hospital). I enjoyed the Lavender scent at first (probably up until I was 8cm) and preferred the Peppermint at the end. They also came in quite handy at the very last stages of labor because I became very, very hot. I remember saying over and over how hot I felt, so my mom would take the cloths out of the refrigerator and put them on my arms and face. Could I have still labored without them? Absolutely. However, they were a nice little treat (I purposely saved them and did not use them while laboring to 5cm at home so I could have something new to try when the contractions got worse). What I did use at home (in addition to movement) was music. Weeks before, I compiled a list of my very favorite jams. Most of them were mellow to peppy, but nothing too fast, simply music I liked that would hopefully make the experience a little easier. I put the playlist on using the house speakers once Max joined me out in our kitchen (maybe 3am-ish) and as I labored from room to room, I'd hear all my favorite songs. Again, for me music alone wouldn't have been enough to cope with the pain, but it was a lovely extra. I fully intended on playing music as the hospital as well, and it just completely slipped my mind! In my last trimester, I purchased the Heartstrings audio CD of prenatal affirmations and guided meditation. I listened to the CD a number or times in my last few months, and liked how I could achieve a shavasana-type state of relaxations with simply lying down and listening to the CD. Heartstrings promoted bonding with baby and positive visualization. I also really internalized the phrase "My body knows how to birth the baby" - this was something I really relied on planning a natural birth (and I believe focusing on the phrase helped my body prepare physically). At one point on the CD, the words say to "relax and enjoy" - I remember listening to this and thinking that if I heard that while in active labor, I'd probably think it was ridiculous. However, actually hearing those words in labor was quite different. I saved the CD to listen to in the car on the ride to the hospital (it was in my CD player just waiting). Max of course thought it was hooey and was making fun of it as we drove, while I was trying to follow the affirmations. We were just getting on the 101 onramp after a rather long and intense contraction, and I heard those words! Relax and enjoy. It reminded me that this was it. This amazing experience of childbirth was happening. It helped me to be present, knowing that the whole event would be fleeting and over before I knew it. For me, I enjoyed doing the visualizations but it's definitely something you have to be open and receptive to in order to benefit from it (I'm guessing it's my California hippie-like tendencies that drew me to doing them). I was incredibly lucky that my husband also happens to me my very best friend, the person I most admire, and completely calm and awesome in challenging situations. Just knowing that he would be there every step of the way gave me so much peace and assurance in my last few weeks of pregnancy. It didn't hurt that he just-for-funsies completed EMT certification back in California and wold be totally fine delivering Baby Klein if need be (medicine was his back-up career choice but engineering won over - still, I think he would have made an awesome physician). There is some quote about joy shared multiplying that joy, and pain shared being lessened - it couldn't have been more true for me in this situation. I know Max didn't actually have any contractions or do any pushing, but having him there physically (to quite literally lean on and sometimes squeeze) and cheering me on mentally and emotionally was everything. Whether it's a doula you bring in, or a friend or family member, having one person to connect with during labor can make such a difference. For me, I couldn't have done it without my husband! I absolutely loved being pregnant, and still think that the day our son was born was the most amazing day. Ever. Despite the pain, it will always be one of the very favorite days of my life.